Let’s start off puppy training with some basic commands. Here’s how to train a puppy to stay. Being able to “Stay” is a useful skill for your dog to learn. If your pup will stay when told, it’s easier to keep her away from potentially dangerous situations or to stop her getting overexcited when something fun is going on. This command can take a bit of time and perseverance to master, but as long as your calm and patient with your puppy, it shouldn’t be too long before she can stay with the best of them. Be sure to keep training sessions to a maximum of 5 or 10 minutes, shorter still with young puppies, since your pup is only a baby and doesn’t have a good attention span. The following points are how to train a puppy to stay. Teaching your dog to go to a designated spot, like a bed or a mat, and stay there can prove useful in a variety of situations—like when you’re eating dinner, watching a movie with friends, greeting guests at the front door or visiting friends and family with your dog. Once your dog has mastered this skill, you can use it almost anywhere, whenever you need her to settle down for a while. Before you can train a puppy to stay, she’ll need to be able to sit or lie on command. If you haven’t taught her to do so, go and teach her now. Then you may return and find out how much easier it is to get her to stay. When working with an energetic puppy, it may be best to try this after a walk or a long play session, once she has expended a bit of that energy. In order to succeed, you’ll have to take things slowly. Get your puppy to sit or lie, then give the command to stay. Some people like to combine this with a hand signal, such as a flat palm with the fingers pointing upward. Wait for about 10 seconds after giving the command, if your puppy hasn’t moved, tell her “yes” or “good girl” and give her a treat. Once she’s had her treat, tell her “okay” or “free” so that she knows that you’ve released her from the command. When she’s got the hang of staying for 10 seconds, increase this to 15 seconds and then to 20 seconds, and so on, until she can comfortably stay for 30 to 40 seconds. Once your pup can stay for a little while with you standing by her, you need to add some distance to the equation. 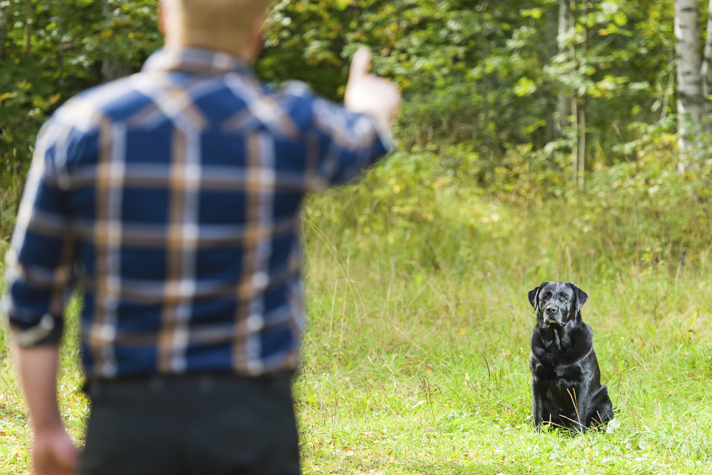 Put her into her stay, then take a step or two backward (it’s best to start be moving backward, as if you turn away, your pup is more likely to follow you), before stepping back toward her, praising her, giving her a treat and giving the release command. From here on out, there’s no tried and true formula. All you can do is gradually increase the amount time your dog has to stay for and how far away you get from her. This process can get a bit tedious, for you and your pooch, so make sure you don’t push her beyond her skill level or past her attention span. Above all, practice patience, and don’t be too hard on yourself or your dog! We all learn at different rates. Remember that all of the time and patience you put in now will help the relationship and connection you have with your dog for years to come! What if She Doesn’t Stay? If your pup makes a mistake and gets up from her stay, don’t get frustrated. It’s a learning process so it can take a little while. Simply ask her to sit or lie again and repeat the stay command. Give her a short, simple stay that you know she can ace so that it builds back up her confidence. If she keeps missing the mark, you should consider whether she’s bored or tired and needs a break from her training. Pushing her or moving too fast will only discourage her.